A medal is a small metal object that is given as an award for doing something important or to commemorate something. There are medals for sports, military, academics, etc. There also exist medals that have religious meaning. Military decorations, service awards, and medals are often confused with one another. 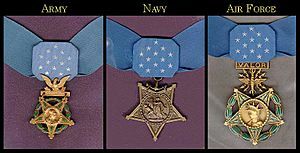 Decoration is the term for awards which require acts of heroism or achievement (such as the British Victoria Cross or American Silver Star). A service award or campaign medal is awarded for serving in a place and time (such as the Iraq Campaign Medal). In either case, an award or decoration may be presented as a medal. In the Olympic Games and many other sports competitions, medals are give to the top three people who took part in the competition. The winner of the competition is given the gold medal. 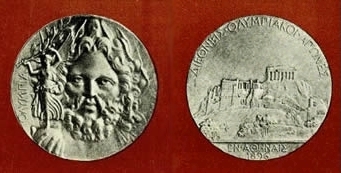 The silver medal is given to the person who came second. The third placed person is given the bronze medal. Bronze medal of Isabella d'Este, princess and patron of Renaissance humanists, distributed as a gift. Breast jewels (medals) worn by members of a secular fraternity in Poland. 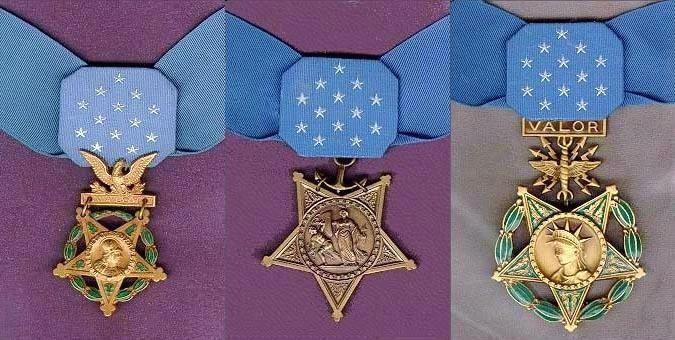 The United States Medals of Honor. Each displays a medal within a unique star-shaped design. A silver medal was awarded to the winner of each event during the 1896 Summer Olympics. Recent Olympic medals are suspended as a pendant from a ribbon, and are awarded in gold, silver and bronze. Medal Facts for Kids. Kiddle Encyclopedia.